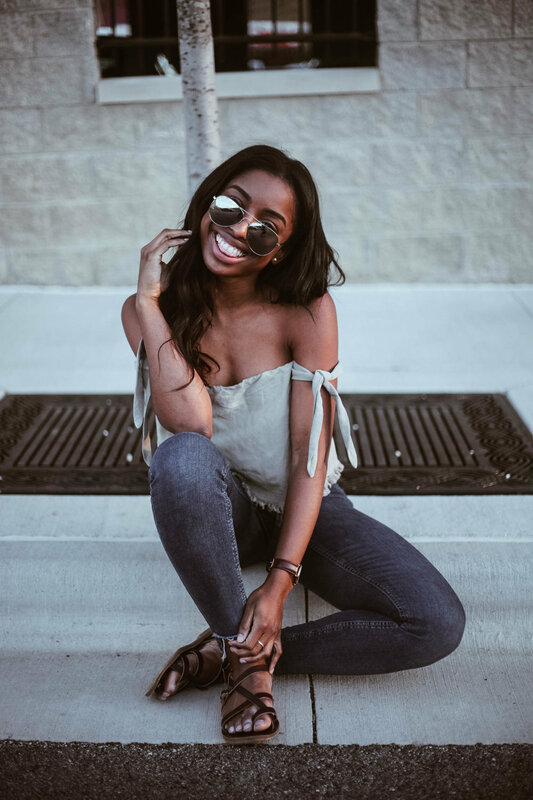 If I've learned anything in my 4 years of being a college student, it's how to style trends on a budget. I mean at this point, I should really put it as a skill on my linkedin profile. 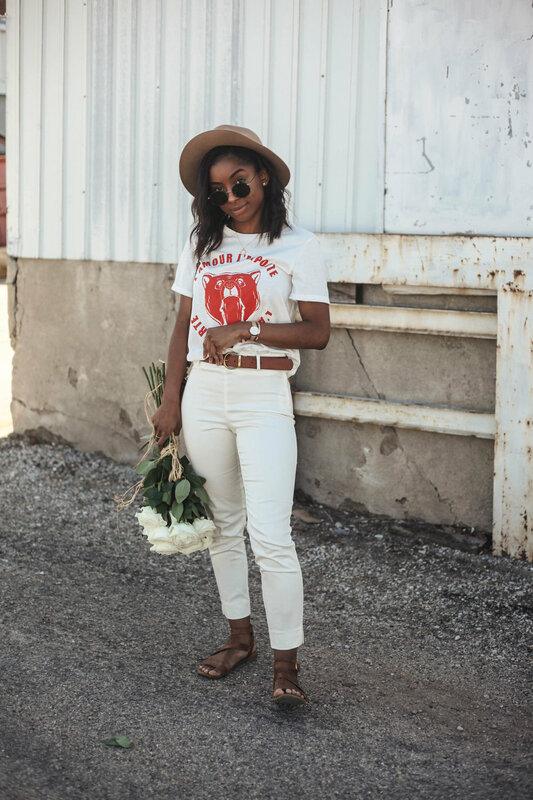 Correct me if I'm wrong, but I'm pretttyyyy sure there's this fashion rule about how you can't wear white after labor day to before memorial day, but this year everyone ~me included~ just said eff it! I mean, who makes these rules anyway and why? I've seen the all-white spring outfit "trend" quite a bit recently and so I wanted to show you my personal "I'm a broke college kid, but still want to be cute" take on it. Not even kidding you, this top was $10 and the pants were $15...now, if that's not the most beautiful thing you've ever heard lol. The other items that I am wearing are things that I either already had in my closet or borrowed (s/o to my roomie for letting me borrow her belt lol). Scroll to the bottom to get the direct links to the items in this outfit and happy styling. But okay on the real -- I've entered this new phase of life where I've tried to avoid buying cheap shoes. *GASP* Before you get your knickers in a bunch I don't mean cheap price-wise, I mean cheap quality shoes. (Ya girl is still a broke college kid haha) When you think about it, it's kind of a waste of money if you ask me. Like, you get a couple wears out of them and then BAM the heel feels wobbly, you've got to toss them away and buy a new pair to fill that shoe void in your heart. Trust me, I know the feeling all to well and that's not a good look ladies...we deserve better. 1) Who doesn't love shoes. So if you're in need of black booties whose heels aren't wobbly or OTK boots that don't slide down your leg -- remember this post and go check out DSW. I thought I'd give you a break from the teddy bear coats, off-the-shoulder tops, and James Jeans to venture over to the men's style world. I have a special place in my heart for men's fashion and I wanted to share a couple of things I feel ever guy should own in his closet with you beautiful humans. p.s. this was just a tester so if you'd like to see more posts like this please be sure to let me know. There are two types of people in this world. You either A: think this is the cutest coat ever and are obsessed or B: you're asking yourself who begged me to wear a teddy bear/ carpet as a jacket. I know, I know everyone is entitled to their own opinion, yes, BUT I just really hope you're not option B lol. 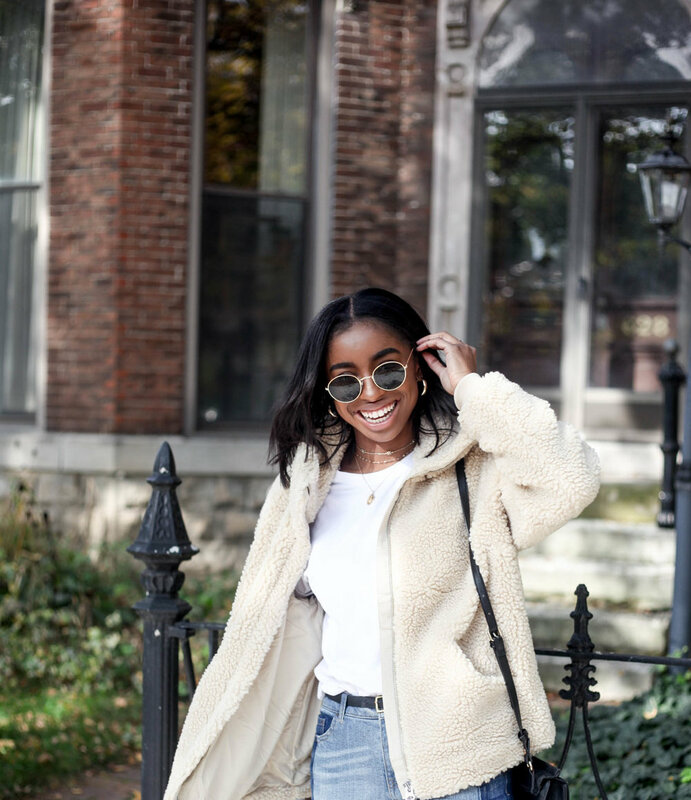 This trend has many names so if you're trying to search it up on Pinterest to see other ways it's been styled, find it at a store, or just figure out what the heck it's called, you can type in: "Teddy Bear Coat", "Sherpa Coat", "Faux Shearling Coat", or "Pile Coat/Jacket." I'd like to call this coat trend "love at first pin." I legit saw this on pinterest and instantly knew I needed it. I'm no veteran to being in love, but I'm prettttyyyyyy sure this coat is what it feels like. When I finally got my hands on this bad boy it was game over. This was hands down one of my favorite fall purchases. I'm going to keep in 100 with you though, I was slightly disappointed with the fact that it wasn't lined on the inside. Maybe I just expect to much? but I thought that if it was fluffy on the outside, it would be on the inside too....but nah lol. However, I'm happy to share that it's still surprisingly warm so it's not a total 'L'. Unfortunately, this trend is a little bit on the pricier side, but I've been able to find some less expensive options all under $100 that I've linked below at the end of this post. With summer lasting a little longer than usual (shoutout global warming), these three pieces spoke to my soul when I was on the site. First off, no color in the pieces I picked -- surprising? Not even a little bit. 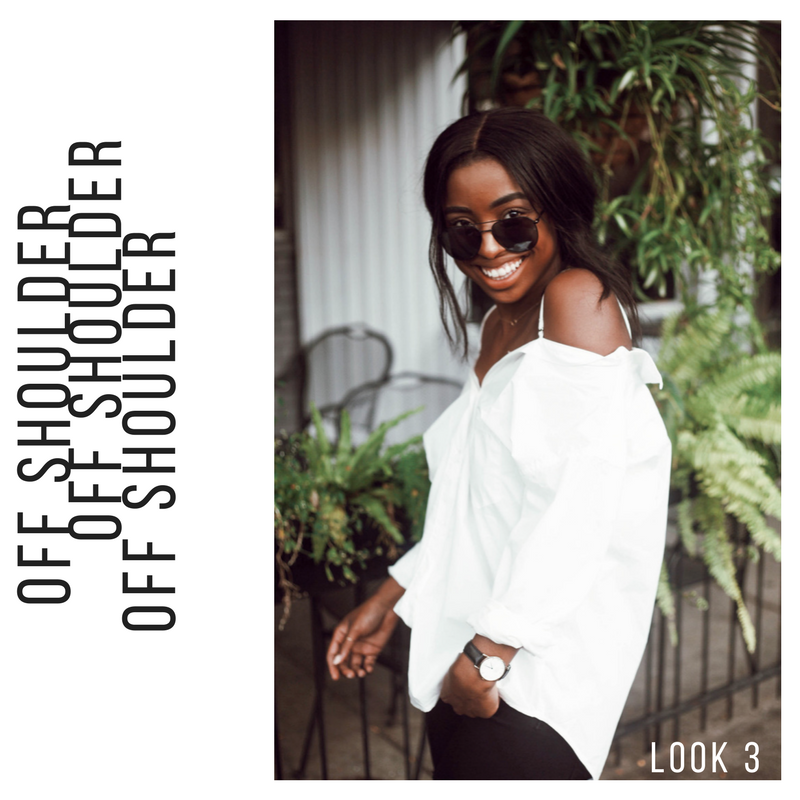 Second, I tried to hit some of the trends I've been seeing with Tobi's off the shoulder oxford shirt, a front tie blouse, and the dress with the twist in the front. So sit back, relax, and happy scrolling. PS. I'm trying something really different with this post, so instead of throwing all of the looks into one giant blog posts or even 3 separate ones, I decided to have this be a true lookbook. 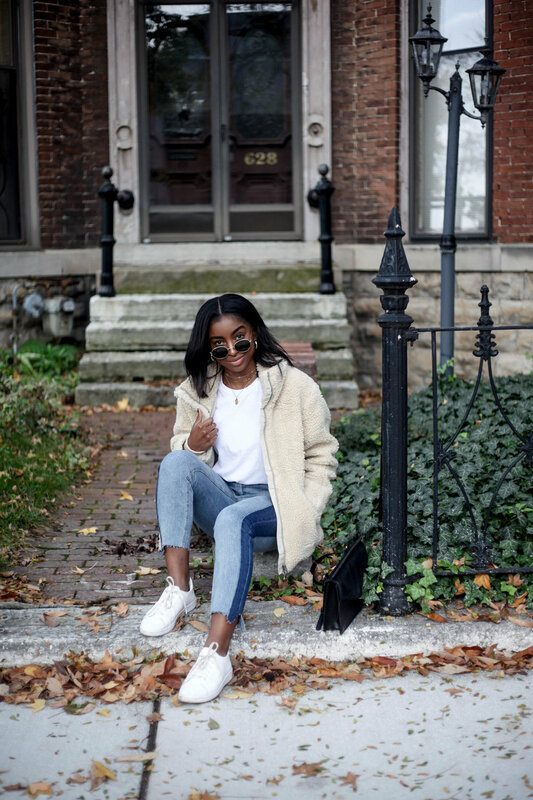 So basically, if you want to see how I styled these three adorable Tobi.com pieces click on the "See More" button to the right of the image. 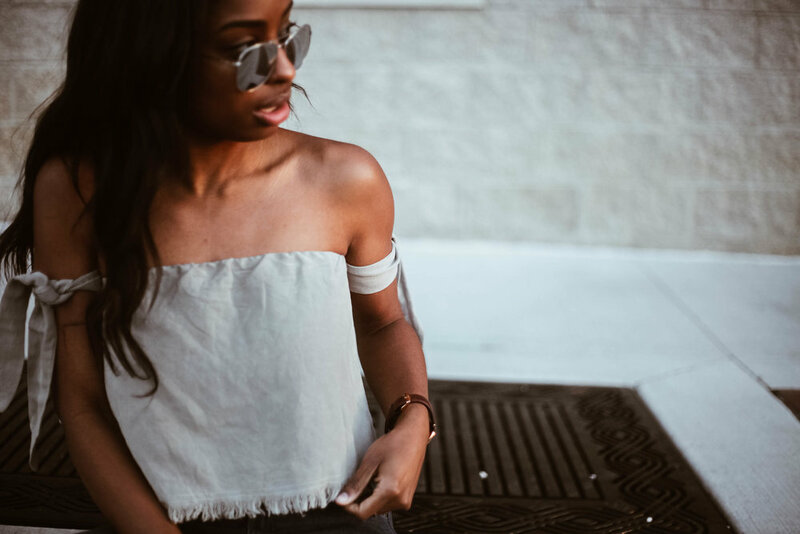 If you're as obsessed with this top as I am, click the link below to see how I styled it. I'll let that one sink in and in the mean time go check out the full look. It's that wear a sweater in the morning and regret it by 12 o'clock type weather. I thought i was cheating the system by wearing shorts and a sweater but nope...mother nature still got me. I thought I figured out the weather...and then it literally laughed in my face. The day I wore this outfit I literally thought that I was a genius. I checked the weather and it said 59 degrees at 9:30 and 72 and 1:30...BIG BET. I finally knew how I was going to rig the system. In my head this is how it was going to go down -- cold in the morning? no problem -- I'd wear a cute sweater...hotter (but not too hot) in the afternoon? betttt -- I'll wear shorts. SIKEEEE. Yeah no, it was hotter than satan's armpit and the sun was blazin at 9 am when I walked out of my house. I couldn't go back and change because I would be late for class. Yeah, the joke was on me. I would really like to start a petition suggesting that the Apple Weather App meteorologist needs to get fired because that app is 99.9% wrong. But then again, I don't know who to be mad at global warming for messing up the seasons, Indiana weather for being bipolar, the apple meteorologist for always leading me astray, or myself for knowing Apple is always wrong and still not downloading the WeatherChannel app lol. BUT ITS OKAY. Why?! Because I looked bomb in my GG Boutique Sweater (even if I was dripping of sweat lol.) I should really stop complaining though, because before I know it this weather is about to be freezing and I'll be praying for this heat back. You guys, I need serious help...I was trying to be cleaver with my blog title (my puns usually never work out...they always sound better in my head but I feel like if I just go with it, nobody will think twice about it lol). So quick story time -- these short are lace up shorts right? So cleaver old mercedes demz was like WOAH IM GOING TO NAME THIS POST 'LACE IT UP'....ready for the kicker? I think I've named like 5 posts lace it up...and none of you guys told me lol. Don't believe me? Search it the little search bar at the top of the page. (I know...SMH Demz) The saddest part is that knowing myself, I was probably really excited EVERY.SINGLE.TIME. lolz @ my life, man. ANYWHO -- you guys, these shortsss. I've never loved a piece of cloth so much in my frickin' life. 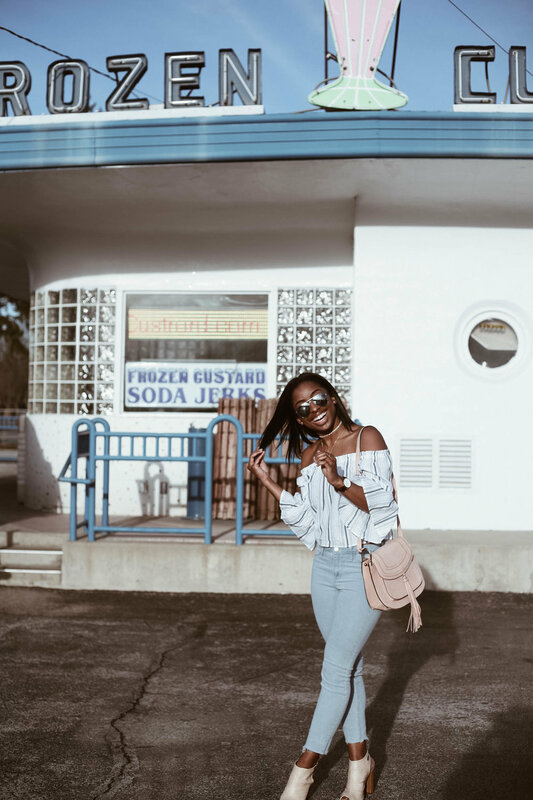 It's such a fun summer twist on your classic denim highwasted shorts and I'm alll for it. These bad boys from GG Boutique are legit perfect. I hope your week was amazing and your weekend is even better ;) I don’t know about yours, but my summer has literally flown by and I can tell you right now I’m v mad about it. I guess time flies when you’re having fun…or being an adult lol. Not even kidding though, there HAS to be some scientific explanation why as you get older, time goes by exponentially faster. Whatever it is, I’m 1000000% not for it. Don’t get me wrong, I mean, not being a broke college student and being able to not have to depend on my parents is kind of amazing…but I’m not quite convinced this whole “adult” thing was created for me. This shirt from Lace + Arrow (scroll down to the bottom of this post for a coupon code and direct link to this shirt) is actually me 100000% of the time. I’m not huge into tanning or laying out lol, so you’ll more than likely find me under a beach umbrella in the shade trying to not get darker, but I’m still a fan of the beach. There’s something beautiful and so carefree about just lying and watching the crashing waves, seeing the adorable little kids make sandcastles, and MAN there’s nothing I love more than getting sand in my weave (that was sarcastic lmao... it’s the absolute worst) . A couple weeks ago, I went to Fort Myers with two gal pals and I’m about to tell you something that tragic that happened and I thought the world was coming to an end (spoiler it’s not really that big of a deal). No I didn’t get eaten by sharks in the ocean and no I didn’t almost drown (mind you I can’t tread water so there’s that, but I’m a freaking good swimmer... some call me the female Michael Phelps or whatever lolz). YOU GUYS, I WAS ON THE BEACH AND MY PHONE DIED. I thought my world was crashing down. No snapchat. No ignoring text messages because I hate texting. No scrolling through the gram. It was beyond tragic. One minute passed, then fourty-five, and then 2 hours….PHONELESS. But looking back, it was the best worst thing that could have happened. I had no stresses. NONE. No texts to contemplate responding to (if you know me, you know I'm the world's worst texter) and no snaps taking me away from enjoying the moment. It was just pure enjoyment and it was kind of beautiful. I know why you're here ;)...Don't we all love a discount?!? Use my code 'DEMIB' for some moolah of your purchase. Hello Beauties -- I'm not quite sure if you know how happy writing this post is making me. this has been the most excting, fun, tiring, Adult week i have ever experienced in my life and I'm not quite sure how i feel about it lolz. Adulting is hard. v hard, but such is life i guess. 1. They're easy: You don't have to put much thought into the outfit, just throw it on. 2. they're versatile: With the right hairstyle and accessories you can make it casual or dress it up. ps. Is it just me or do you get some major Beyonce lemonade vibes from this dress?! OBSESSED. I realized while I do talk a lot on my blog...obviously, Demi, its called a blog for a reason *facepalm* I don't ever talk about my blogging or how I got started or what keeps me going. While I'll probably save the details for a later date, what I'm about to talk about is something extremely important to me as a "blogger" (I'm growing to dislike that term but for this post I'll keep it around...). I'm not sure if you noticed...or maybe it's just me but everyone has a blog -- whether its food, fashion, travel, fitness...everyone has one. Not going to lie, it drove me crazy for a little bit, but then I realized something...it creats such an incredible community. You can search hashtag and find people that see life how you see it. And if not, you can get their perspective and it's honestly a beautiful thing. Now don't get me wrong, some people haven't figured out that bashing other creatives doesn't do ANYTHING so not everyone is genuine and nice, but I think collaborating instead of making it a competition is KEY. These boss babes Emma from Emma's Style Blog + Caitlin from Caitlin Eliza are also Purdue Bloggers. We're all different majors, sororities, and have different backgrounds, but we connected becauase we share a love for one thing -- fashion. So, go DM someone whose work you admire. ~guilty~ Be honest, them how they inspire you, and connect with other people that love what you love (or don't and have a different eye). Whether its someone at your high school, college, or office. Support each other...and grow together. Happy Friday beautiful humans, spirits at an all time high. Why might you ask?! Well first, it's Friday....but also, I get to go home, see my pup (and family too lol), and last but not least...THIS WEATHER IS INCREDIBLE. It's a solid 75 degrees here in West Lala and I'm all for it. This warm weather and insanely fabulous vibes means one thing is rolling around...festival season. Coachella, Bonaroo, Lollapalooza, Hangout Fest...the list goes on. I'm not going to lie, I'm having major fomo watching everyone and their mother on IG and Snap en route to weekend one of Coachelly, but there's no point in sulking around just wishing I was there. I have to work to get there. So give me a year and we'll see if power moves get me there in 365 days. Why hello there beautiful humans...long time no see. I would first off like to apologize yet again for slacking with the blog posts, but in my defense...SCHOOL IS HARD OKAY?!?! but have no fear ;) WE'RE BACK IN BUSINESS. I don't know about you, but I LOVE getting flowers (granted 95% of the time I buy them for myself and the other 5% are from my family members...but hey who's counting). There's something about fresh flowers in my room that really brightens up my mood, so why pass up the opportunity to make one of your friends feel that exact way same way?! If you follow me on the gram, you probably saw my post about how I got one of my besties flowers because she's well, kind of amazing. You should try it, it's actually really fun. I challenge you to write someone you love and appreciate a note and buy them an inexpensive bouquet of flowers (cuz I know we're all ballin' on a budget). I took myself to Rubia's Flower Market last week- Purdue's best (and only) flower market, wearing this super comfy and casual errand running outfit, and picked out the most beautiful bouquet of flowers that just happened to be called "Demiluxe" Bouquet....coincidence? I think not. In other news...this jacket....guys...just wow. 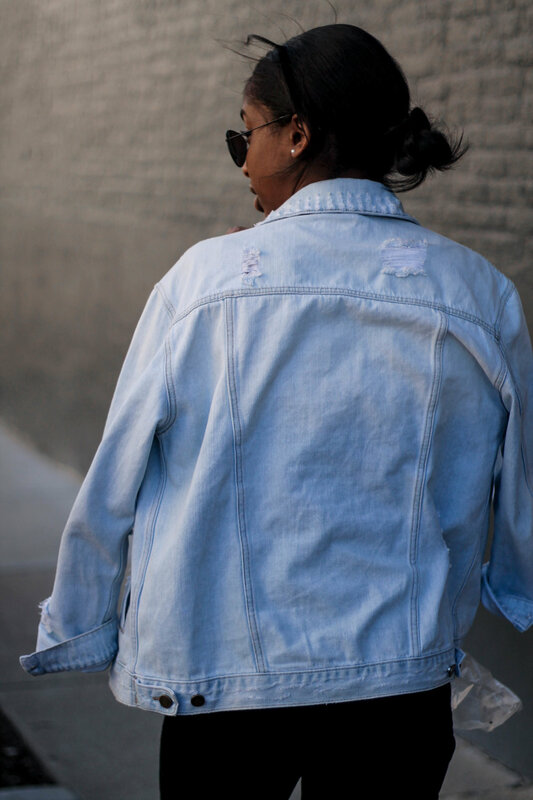 If you've been looking for the perfect oversized denim jacket I think I have a winner for you. As you may know if you follow my blog, I've partnered with GG Boutique quite a lot in the past and when they posted this new arrival on their site I just about peed my pants. I'd been looking for one for ages and needless to say, GG had my back. First and foremost, I would like to thank global warming + mother nature for making this outfit possible. I should probably be more concerned than I am that it was 70 degrees a couple of days ago, but I really can't even be mad...cuz like, the fit. Soooooo how 'bout this weather... but seriously. I'm pretty sure there has to be a science behind why blue skies make me so much more hyper and happy. I don't know what it is guys, it literally changes my mood. Don't believe me? Well, let me tell you a story that will probs make you. Last week it was beautiful out -- mid to high 60's, the sky was beautifully blue, and i was in THE BEST MOOD. Me being the stellar student I am, decided to go to class and not skip to enjoy the weather....only to be rewarded by getting my naked iPhone knocked out of my hand by some girl in a hurry. My naked iPhone was knocked out of my hand and dropped face down on cement...(if you didn't cringe after reading that you don't have a heart lol). That's not even the worst part of the story lol. I couldn't be mad. I literally couldn't find it in my body to seem even the slightest bit angered. This girl gave me an apologetic, scared look and all I did was smile.....I JUST SMILED. This girl just knocked my pristine iPhone on concrete, cracked it and what did I do? I picked it up, turned it over, and smiled. Not going to lie, I lowkey held in the tears because thats $175 for a new screen and I'm a broke college student...ain't nobody got money for that). There you go guys, that's basically a scientific proof as to how blue skies make you happier. Moral of the story?